Act I The musical opens with the entrance of Officer Lockstock, a tough-talking beat cop who doubles as the play’s narrator. Apologizing for the fact that the show opens with Too Much Exposition, Lockstock explains how a terrible water shortage has crippled the Gotham-like city he serves, forcing the government to outlaw practices which might otherwise waste the precious resource. With the help of the street urchin Little Sally, Lockstock goes on to explain that to conserve water, the citizenry must now use the public, pay-per-use amenities owned and operated by Urine Good Company – a private corporation to which the government has assigned this public utility. Citizens who try to circumvent the peeing fee by going in the bushes or some other such place risk severe punishment. Offenders, Lockstock sings, are sent to Urinetown, a mysterious place where many have been sent but from whence no one ever returns. Early morning at the poorest, filthiest urinal in town. Old Man Strong, a poor man, argues with the urinal manager, Penelope Pennywise (also known as Penny). He doesn’t have enough money for the peeing fee this morning, and with a crowd of customers behind him clamoring for their turn, he asks Penny to give him a break. Penny refuses, explaining It’s a Privilege To Pee. Old Man Strong appeals to his son, Bobby Strong, who serves as Penny’s assistant. The law is the law, however, and Bobby finds himself powerless to contradict it. Unable to contain himself any longer, Old Man Strong relieves himself right there on the pavement. Officers Lockstock and Barrel enter and arrest Old Man Strong, hauling him off to Urinetown. 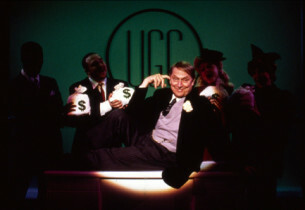 Meanwhile, at the corporate headquarters of Urine Good Company, Caldwell B. Cladwell, the evil president of the urinal monopoly, discusses the timing of the next round of fee hikes with Senator Fipp, a corrupt politician who fears the effects Cladwell’s price gouging will have on the populace. Their discussion is interrupted by the return of Hope Cladwell, Caldwell’s sweet-hearted daughter, just home from The Most Expensive University in the World. Cladwell introduces Hope to his staff, welcoming her as the newest employee of the corporation. Taking a moment to bask in the wealth and power they’ve accumulated, the staff praises Mr. Cladwell even as Cladwell praises himself. Later that day, having disposed of the troublesome Old Man Strong, Officers Lockstock and Barrel share in a Cop Song to discuss the horrors the trip down to Urinetown entails. Hope arrives on her way home from her first day at the office, and then Bobby joins them, having closed his shift after the late-night rush. After a few words of advice about suspicious appearances, the cops leave the kids to get to know each other. Tormented by his father’s recent arrest, Bobby asks the beautiful newcomer for guidance. Hope tells Bobby to Follow Your Heart. Arriving for work the next morning, Bobby is confronted with news of the latest round of Cladwell’s fee hikes. Penny shouts down the protests of her customers (now unable to meet the required fee), commanding them to pony up or step aside. Bobby’s mother, also short the required cash, stands before Bobby asking if she’ll be turned away, too. 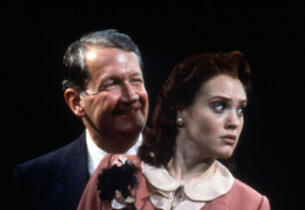 Still tormented over having stood by while his father was taken to Urinetown, and emboldened by Hope’s words of optimism, Bobby seizes the moment and opens the amenity for the people to pee for free. As Bobby rallies the poor, joyously telling them to Look At The Sky, Penny warns Bobby that he – and everyone – will surely pay for what he’s done. Back at Urine Good Company headquarters, Cladwell learns of Bobby’s insurrection at the urinal. Don’t Be The Bunny, he instructs Hope, as he waves aside her concern for the rabbit-like masses. Vowing dire consequences for Bobby and the rebels, he and the police head to the urinal to suppress the uprising. Once at the urinal, Cladwell orders the cops to bust heads, but not before Bobby can initiate the obligatory Act One Finale. Hope realizes her words mistakenly inspired Bobby to start a revolution, Bobby realizes Hope is a Cladwell, and the poor realize they’re no match for Cladwell’s cops; so Bobby kidnaps Hope to allow the rabble to escape the punishment promised by Cladwell. Act II As the new act begins, Hope is tied to a chair at the underground secret hideout of the Rebel Poor, Cladwell is on the move demanding his daughter’s recapture, Bobby is making his way through the city with his mother spreading word of the coming Revolution, and Little Sally barely evades capture by Officer Lockstock as all ask What Is Urinetown? Hungry for payback and certain that it’s only a matter of time before they’re all captured and sent to Urinetown, Hot Blades Harry and Little Becky Two Shoes insist that the rebel poor Snuff That Girl. Bobby enters, horrified at how vengeful the poor have become. He tries to cheer them with more positive thoughts, singing of the steady road to social equality in Run, Freedom, Run! Penny arrives with a message: Cladwell is prepared to consider the rebels’ demands, he wants to meet with Bobby. Bobby agrees. At Urine Good Company headquarters, Bobby and Penny arrive to negotiate a settlement to the standoff. Bobby wants to trade Hope’s safe release for a total revocation of Cladwell’s cruel and oppressive peeing fees. Cladwell refuses, offering instead a large cash bribe to Bobby if he’ll convince the rebels to return to the established order. Bobby refuses, so Cladwell orders Bobby’s arrest, commanding Officers Lockstock and Barrel to take the troublemaker away to Urinetown. Penny, desperate to protect Hope, reminds Cladwell that this double-cross could mean certain death for his daughter. Cladwell, ever cold-hearted and power-obsessed, dismisses the danger and orders the expulsion anyway. In spite of her loyalty to UGG, Penny can hardly believe the depth of Cladwell’s evil. She wonders, Why Did I Listen To That Man? Subsequently, Senator Fipp, Hope, and Bobby ask the same question as they ponder their fate at Cladwell’s hands. At the same time, Officers Lockstock and Barrel hustle Bobby off to his doom – a long fall off the roof of UGG headquarters. 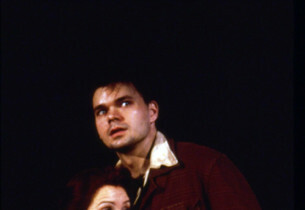 Bobby realizes too late that there is no Urinetown after all. Execution, not exile, has been the fate of those brave enough – or desperate enough – to break the town’s strict peeing laws. 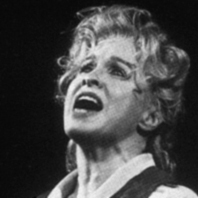 Back at rebel headquarters, Little Sally recounts Bobby’s longing last words for Hope in Tell Her I Love Her. The poor are at first grieved by Bobby’s death, then filled with lust for revenge. As they prepare to do away with Hope, Penny stops them, shocking everyone with the revelation that she is Hope’s mother. Hope, deeply moved by this news and disgusted by her father’s betrayal, convinces the rebels to let her help them overthrow the despicable Caldwell B. Cladwell. Under Hope’s protection, the rebels sing how We’re Not Sorry, nor are their enemies, as they make their way through the shattered streets to the headquarters where Cladwell directs the continuing crackdown. Suddenly outnumbered in his lair, Cladwell and his henchmen are overthrown in a stunning coup. Cladwell is led away to his own trip off the roof of the UGG headquarters rooftop, but not before Penny and Cladwell confess their sorrow – or lack thereof – for the lives they led in a We’re Not Sorry (Reprise). With the blessing of the battle-weary population, Hope takes control of the monopoly, opening all the amenities to all the people, to pee for free whenever they like, for as long as they like. She sings of the better world she envisions in I See A River. Her utopia is short-lived, however. 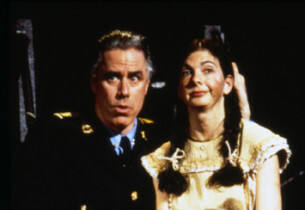 Officer Lockstock enters as he did at the beginning of the show to explain that Hope’s idealism depleted all the water reserves. As evil as Caldwell B. Cladwell was, he had actually effectively rationed the water resources. 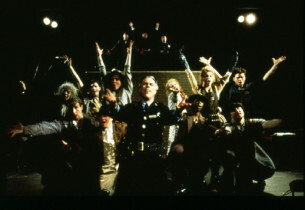 An unconventional musical dealing with unconventional ideas, Urinetown, written by Greg Kotis (book and lyrics) and Mark Hoffman (music and lyrics), opened on Broadway at the Henry Miller Theatre, on September 20, 2001. Under normal circumstances, it might have been nothing more than a ripple in a busy season, but in a city still under the shock of the September 11 attack on the World Trade Center, it seemed like a sudden breath of fresh air, a burst of energy that was needed to revitalize Broadway and the city with it. It represented an escape from realities, a show that dared to be satirical in a time of grief, which dealt with big business, social irresponsibility, bureaucracy, small town politics, and other aspects of everyday life. Its storyline was very simple – after a drought of several years, a terrible water shortage has forced city management to ban private bathrooms, with everyone in town forced to use once a day the public toilets that are controlled by a big corporation. 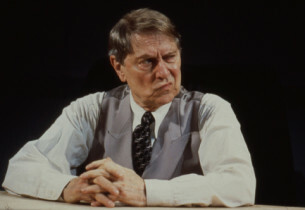 Rebellion is only one short step away… With John Cullum at his menacing best as the head of the big corporation, “Urine Good Company,” the cast (which included Jeff McCarthy, Hunter Foster, David Beach, and Ken Jennings, among others) was uniformly superb under John Rando’s imaginative direction. 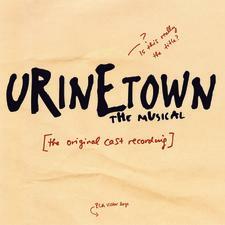 As a result, Urinetown enjoyed a long run of 965 performances, getting nine Tony® nominations and winning three (for Rando’s staging, for its book, and for its score).